Here I am sitting in bed, at Wyndford Farm, (away again???) about to start my quiet time. As I close my eyes and ask God for His presence I am prompted to recall what I have heard since the first rays of sunlight this morning a sign that God is already present . Creation awakes to the sound of the Redchested Cuckoo. Have you heard his call of “Piet-my-vrou, piet my vrou” which is loud and goes on and on and on. 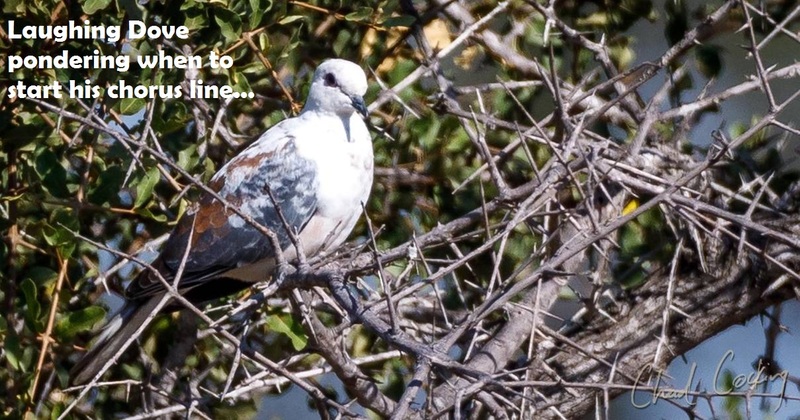 I hear the Cape Turtle Dove calling “ work-harder, work-harder” …much repeated (is he talking to me being still in bed?) Then the Crested Barbet starts. His call sounds like a car battling to start or a muffled alarm clock…”trrrrrrrrrrrrrrrrrrrrrrrr”, which continues sometimes for long periods. Then there is a call that I do not recognise…if only Chad was with us! What call did you wake to this morning? What does God’s call sound like to you? Do you always recognize His call or are you like me seeking His presence not realizing He has been calling all morning hoping I will acknowledge His constant presence. Take care and have a God time until we meet again next Wednesday.